The transparent methods ( Transparent Proxy or Intercept ) force to pass all packets trough the proxy. As Artica is the main gateway all nodes are transfered trough the proxy. 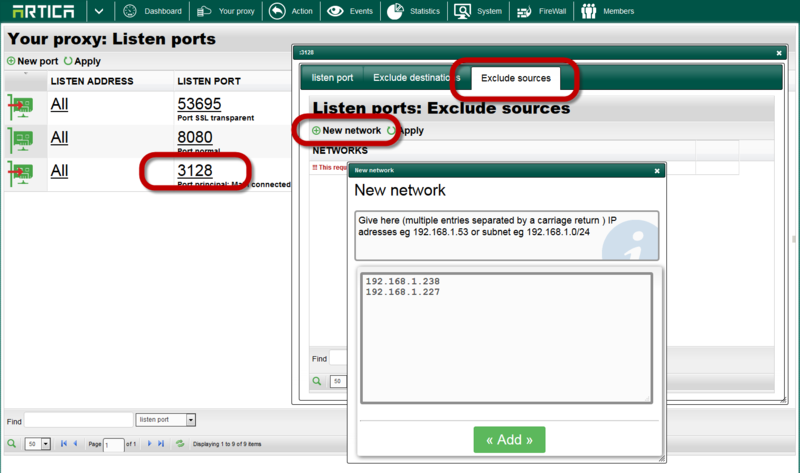 Features can be seen only if the FireWall is activated and if you using Transparent Proxy or Intercept methods. On the main table, click on the desired transparent port. 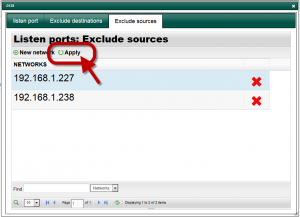 Exclude destinations did not pass trough proxy packets that must be forwarded to specifics subnet/ip addresses. 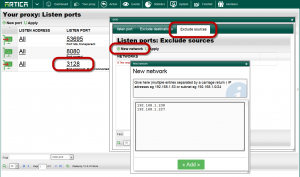 Exclude sources did not pass trough proxy packets from specifics subnet/ip addresses. Click on New network in order to add excluded items. Add IP addresses or subnets separated by a carriage return. When finish, click on Apply button to make rules in production mode. ← How to reconfigure proxy service ?